So Many Stamps So Little Time: Spring Coffee Lovers Blog Hop! Good Morning (Coffee mugs clinking.) and welcome to my stop on the Spring Coffee Lovers Blog Hop! 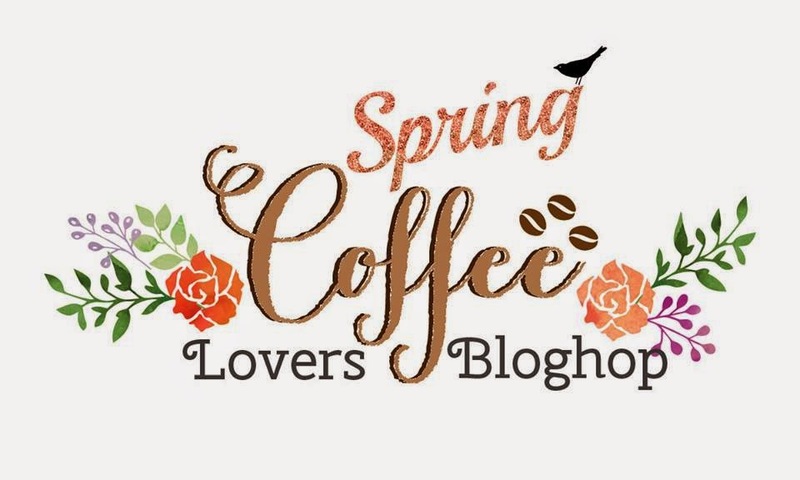 The lovely and oh so sweet Amy Tsuruta has put together a Spring version of the very popular Coffee Lovers Blog Hop and I am thrilled to sponsor this hop again! Here is what I created for today's hop using the Stampin' Up digital download brush set "Perfect Blend". Using a digital cutting software program I arranged my coffee cups with the sentiments in a fun background pattern. I colored them with Stampin' Up! Blendabilities using Soft Sky, Calypso Coral, and Daffodil Delight. I added a fun wooden frame using the SU Photopolymer set "Sweetie Pie Frames". Here are some of the fabulous ways you can win a fantastic prize in today's hop! Super Sponsor prizes will be picked via random.org based on the hop inlinkz. Winners will be drawn and the names given to the sponsor of the prize won and the winner will be contacted via email or Facebook. FLASH Sponsor prizes will be picked via random.org based on the hop inlinkz. Winners will be drawn and the names given to the sponsor of the prize won and the winner will be contacted via email or Facebook. All winners will be drawn/posted during the week of the hop. • All Winners will be posted on the Coffee Loving Cardmakers blog on Sunday, March 8th. I am happy you stopped by today and I hope you have a wonderful time hopping!! Love these cups Veronica and that brown ribbon stands right out! I love the sentiment on these adorable coffee cups! Love your card!! Love the repeated stamping and the delish lid colors! So cute, and that peek-a-boo washi...perfect! This is great! Love the cups, and your bow is outstanding. Really makes the card pop! Ooh- Stampin up have digi files?! Love the way you've coloured it- fab card! Beautiful card. This is a great stamp set. fantastic card. love the coffee/sentiment background you created. thanks for being a sponsor! So fun and love the addition of the cute frame. Thank you for being a sponsor. Really cute! I love the different color lids! Cute cards. I like how you have the sentiment hanging from the big bow. Love that sweet paper and then hanging frame is so cute! The frame is such a great addition to all of your Spring -ee cups! Thanks for being a sponsor Veronica! love what you did with this set. love what you did with this set! Adorable card, and your colors are awesome!! Your card is beautiful. LoVe it! Thanks for sharing. Thanks for being a generous sponsor. LOVE that background! Fabulous card!! ♥ Thank you for being a sponsor! Cute card! I have that stamp and love it. love the repeating pattern! fab card! thanks for being a sponsor! Very cute card! I love the design and the fresh colors! Oh my gosh, love the background! My fave so far on the hop...Thanks so much for sponsoring! Love those fun colors. They're the perfect Spring combo! 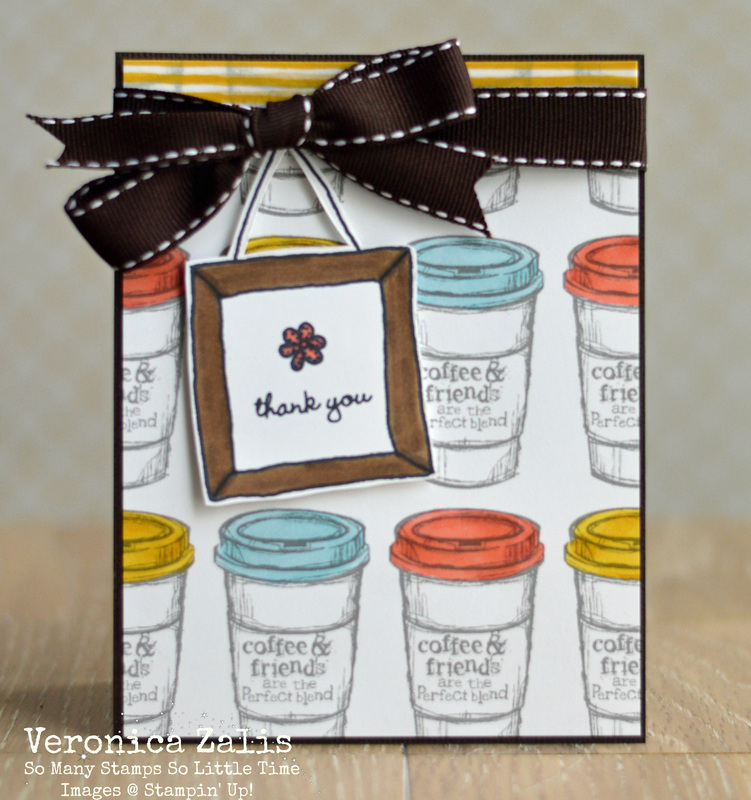 Beautiful card, Veronica, love the cups and the colors! Thanks for being a sponsor for the hop! Have a Frosty good Friday! This has to be one of the most perfectly tied bows I've ever seen! I'm so jealous of your abilities. THANK YOU for being a sponsor and helping to make this event so much fun for all of us! Oh my, I love the background you created. Adds lovely color to the card! This is adorable! Love your background! What a great card! I love the way you created your own background! This is so so sweet...love all those coffee cups! Your card is so fun with the repeating cups in wonderful colors! Thanks for being a sponsor! Oh this is so super cute, thanks for the chance to win!!! So fun and super cute!! Love the colored lids; they add the perfect pop of color. What a fun card! Thank you for sponsoring the hop! OH this is so fun! LOVE how you created the background! fabulous! I love the colors! Why don't I have this stamp yet?! what a fabulous card! love the colors and the feel of this card! thank ou so much for being a sponsor and creating such great inspiration! Love your card, Veronica! The repeated stamping and the colorful lids colors are super cute! Fab! Still haven't gone digi. Thx for the inspiratin! Love the background you created on this card. Well done all the way around. Love your coffee card! I love the stamps you used! Thank you for sponsoring the hop! Very cool! I used this same stamp on my projects! I'm a huge Stampin' Up fan! Thanks for being a sponsor! I love love love the cups background plus the colors you used! I love the background you've created! The colours are perfect for Spring! This is a hilarious coffee card:it's wonderful. You are very creative. Awesome card and stamps. Thanks for sponsoring the hop. The cups make a great background! Amazing stamping!!! Love this card! Super cute! I love the soft colors! Love your own BG, fabulous creation! This is awesome, great, great card. Thanks for being a sponsor. Love the cups and the coloring! That bow is just perfect! Wow! This is an amazingly Fabulous Card!! Love your arranged background paper and how you colored the lids..great card! Thanks for sponsoring Veronica! What an awesome way to use this digital download! Fabulous card! Perfect Blenz is one of my favourites right now. Love the idea of turning it into a background paper. Thanks for sponsoring. I love everything about this card Veronica. I like how you colored the lids on this coffee cup background. The patterned background you created is perfect! Love the card. Such pretty colours and a cute sentiment sign. This is really sweet. Love the colors and that fabulous brown ribbon! Oh,this is great! I need to practice more with the digital studio.Your card rocks. Thanks a latte. This is so much fun! Love the whole thing! What a cute card! That background is adorable! Your card is lovely and that coffee cup stamp is great! OMG such a beauty. I love how you colored each lid different and this stamp is on my got to have list. super cute card, love that set! thanks for sponsoring!